We present our plan to measure X rays from Ξ − atoms for the first time in the world at J-PARC. 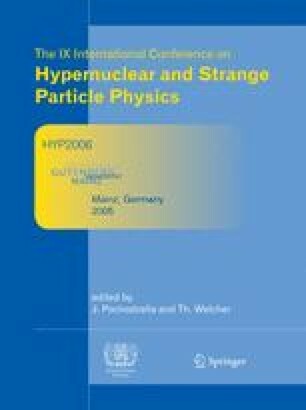 The measurement of X rays from Ξ − atoms is a promising method to study the optical potential between Ξ − and a nucleus as proved in the cases of other negative hadrons (π −, K −, \( \bar p \) , and Σ −). While we are intending to measure X rays from as many targets as possible over the periodic table, we have chosen Fe (iron) as the first target because the measurement will be the easiest and because large X-ray energy shift and width may be expected. Choice of other targets will be determined based on the result of the first experiment. We can accumulate several thousand counts of X rays and determine its energy shift down to ∼0.05 keV. This is sensitive enough to observe expected energy shift (∼1 keV) with reasonable accuracy, while sensitivities for X-ray width is somewhat weaker (measurable down to ∼1 keV).